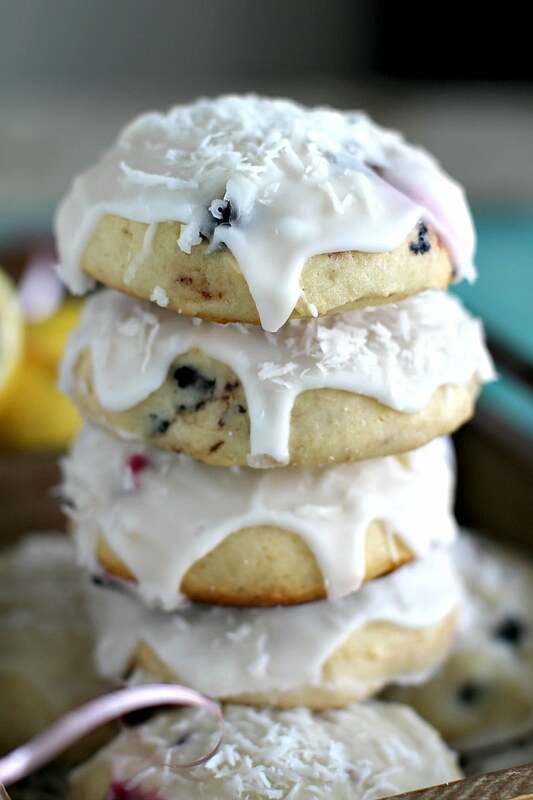 Lemon Ricotta Cookies made with fresh lemon juice, lemon zest and juicy blueberries and covered in a lemon coconut icing. We love making easy and delicious cookies like White Chocolate Lemon Cookies, Cranberry Pistachio Cookies and Flour Less Peanut Butter Cookies. Lemon Ricotta Cookies are the perfect companion to your morning coffee. They are also perfect during any season, their soft and fluffy texture is reminiscent of a muffin top. Loaded with juicy blueberries and tons of lemon zest. These Lemon Ricotta Cookies are incredibly easy to make, and you can dress them up or down. 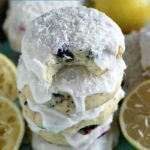 I personally prefer a touch of lemon icing on mine, while my husband and son prefer theirs loaded with icing and covered in coconut, which reminds me of a fluffy snowball. Fresh lemon juice, vanilla extract and fresh lemon zest are added to the cookies for an outstanding fresh flavor. The juicy blueberries, burst with juice and complement the citrusy flavor. These cookies are perfect for those who prefer a soft and flavorful bite. Tall, soft and fluffy these cookies are delicious served with milk, hot tea or coffee. 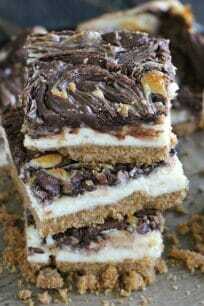 Firstly, they are very easy to make. In addition, a classic cookie recipe is used, so takes these cookies to new flavor level. Also, they are incredibly fresh and aromatic. Would make for some pretty darn cute hostess gifts. Lemon, blueberries and ricotta are just perfect together. Lastly, they are easily transportable. Then, set your tool over a cutting board. A microplane produces a very fine zest, so perfect for baking and cooking. If you don’t have a microplane, use the smallest holes on an ordinary grater. After, grate the yellow skin of the lemon only. Grate just enough to get through the yellow skin, this way you can avoid the bitter white pith underneath. How long will Lemon Ricotta Cookies stay fresh? The Cookies can be stored wrapped in plastic wrap at room temperature for about 5-7 days. Hence, don’t be afraid of keeping them for few extra days. Can you store and freeze Lemon Ricotta Cookies? 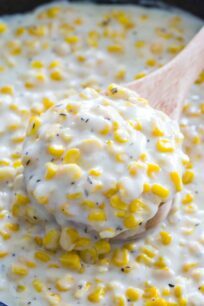 In a medium bowl, combine dry ingredients: flour, baking powder, and salt and set aside. In the bowl of an electric mixer fitted with the wire whisk, beat the butter and granulated sugar until light and fluffy, about 3 minutes. Add the eggs, 1 at a time, beating until incorporated. Add the ricotta cheese, lemon zest, vanilla extract and lemon juice, beat until all combined. Using a spatula, stir in the dry ingredients and lastly, gently stir in the fresh blueberries. For flatter cookies, spoon 2 tablespoons of dough for each cookie and place onto the baking sheet. For taller, more muffin top like cookies, use an ice cream spoon to scoop the dough onto the baking sheets, 1 scoop per cookie. Line the cookies 1.5 inches from each other as they will expend. Bake for 15 - 20 minutes until slightly golden at the edges. Mid baking switch and rotate the trays: the upper one goes onto the lower rack and vice versa. Once baked, remove from the oven and let the cookies rest on the baking sheet for 30 minutes before transferring to a wire rack. In a medium bowl combine the confectioners sugar and lemon juice and stir until smooth. Spoon about 1 tablespoon of the glaze onto each cooled cookie and using the back of the spoon spread it to the edges. 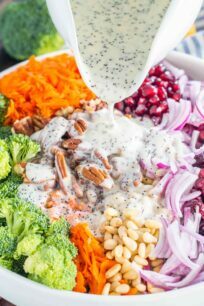 Top immediately with shaved coconut. Let the glaze harden for about 2 hours before packing the cookies in an airtight container. 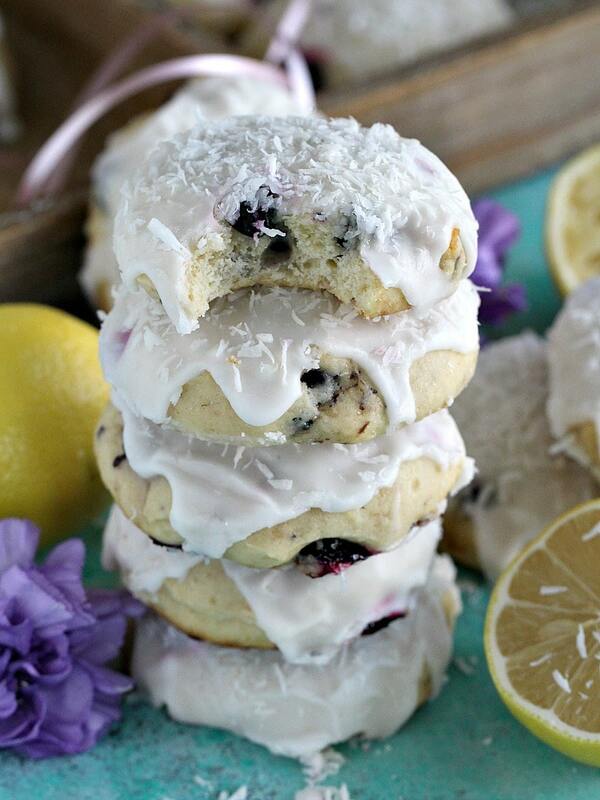 These are gorgeous, and I’ve always loved the blueberry-lemon combo. The ricotta sounds amazing, as well! Gosh these are all of the most amazing flavors ever! I want this! I love, love ricotta cookies! 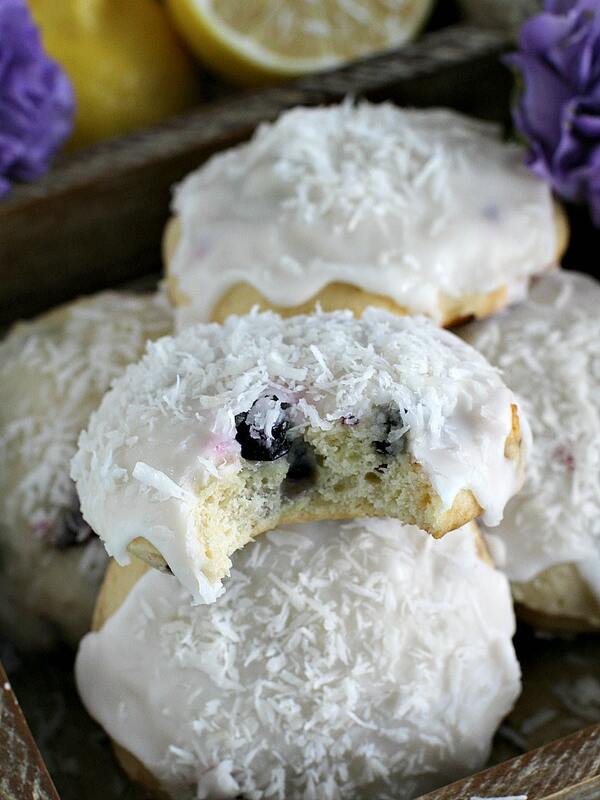 How delicious to make them with sweet blueberries!! Those cookies are just beautiful! I bet they’d be a big hit at a cookie exchange. Do you think you can freeze them to keep longer?